This Blog has been created to inform 7mm modellers what is new with Keiran Ryan Models_7mm. From here there will also be instructions available for 7mm kits. I have just release a updated 7mm lower quadrant signal kit, which are now available for sale. The kit also come with aCD , containing a 102 page comprehensive instruction package in PDF format. This instruction PDF can also be found on the Keiran Ryan Models web site or follow the direct link below, and click on the pdf file to download it (6.1meg) and save it to a folder. 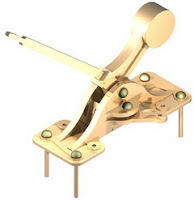 Other signal components will be available soon in 7mm, so keep an eye on this blog and the KRM web site. I just thought that I would provide a new story line . This story started in 1989 when I designed our house at Picton (NSW). I had permission from "She who must be obeyed" that I could incorporate a train room into the house as long as she got her kitchen and bedrooms, and all the other stuff that women want in a house. As an owner builder, I decided to continue to excavate from where the garage side finished, and go just a little further, whilst not undermining the footings for the side of the house, so that the train room could be there from the start. I originally placed 5 x 200mm Universal Beams under the bedroom (Reinforcing) approx 4.6 metres long. I should have kept going with the steel beam idea, as they were relatively cheap then, compared to now, however I didn't and placed 12 brick piers in the middle section of the house. The end result is that I have a 8.8m by 4.6m open area which runs into an area of 5.6m x 7.2m with 12 double brick piers. I fully intend on removing 9 of the piers and replacing them with universal beams, leaving 3 piers to support the beams. I have seriously restarted digging the sandstone to a level where a 100mm concrete slab can be laid, a 8mm bessa block wall built and a steel frame built on the bessa blocks, to be clad in villa board and a the whole thing air conditioned. This is a massive job, but so too was building the house, and it was finished. To add to the problem the clay has found a water table so I needed to place a concrete trough against the clay/sandstone wall and a draining system to divert all water from the bessa blocks. Check out the graphic below. The blue lines indicate the modelling area. Lots of work to be done, but I am looking forward to the challenge. The dumpy is absolutely essential for the correct levels. The blue lines indicate the modelling area. This is stage one, stage two will include pier removal and more excavation. I could probably hide a helix in the far left corner, but then I would have to explain that is there to allow the trains to migrate to the back yard, and --- that's how the fight started. More to come, much more . PS this is for a 7mm layout. I have released a group of new sleeper laying jigs to assist O Scale modellers to lay sleepers and also asist in lining up the first rail so as to build more accurate track. The jigs are made from 1.5mm acrylic and come in the fiollowing configurations. 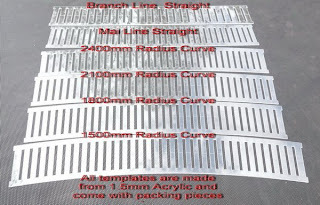 Branchline Cirved Track is drawnup, but will only be produced on demand. 2700mm and 3000mm curved radius tjigs are also available on demand. The Jigs come with 10 packing spacers to allow the sleepers to be glued to the base board eliminating the possibility of the Jig being glued to the board. They also have 6 holes located around the outside of the jig for locating pins to be used, as well as holes for pins that assist in lining up one rail at the correct location so that the track can be located and centred. The jigs accept the previously available sleepers produced by Mt Albert in Canada, and now being produced by Kappler and imported by Warren Herbert of Gwydir Valley Models. Because of the sleeper variation through the production process, some sanding of timbers may be required. Welcome to my KRM 7mm blog. This post is the first of many, to easily show updates to the 7mm Parts and Kits section of Keiran Ryan Models. The update will have links directly to the Kits and Instructions. In most cases the instructions will be in PDF format that the modeller can either read on line or save to their hard drive. The simpler kits will just have a text paragraph that will give a simple instruction and possibly a hint or tip on haw to use the parts. The first kits to have full instructions are the KRM 7mm_009 Hold Down Lever and the KRM 7mm_011 Ladder Forming Jig, pictured here. You can also go directly to the 7mm page by following this link. As kits and instructions become available on line I will be announcing them here, with links to the instructions. The type of instruction that you see at the 2 above links will be the typical format in the future for all KRM Products. While those with out Internet access may appear not to be catered for, if you are a member of a library, you can access the information when you go to the library, and print of the instructions. Welcome to Keiran Ryan Model_7mm. From this Blogg I hope to provide a quick easy way to inform 7mm Railway Modellers of the happenings of Keiran Ryan Models_7mm. I hope to include links to new product items, photos of future projects, and photos of models and prototyps of future projects.